Sample one of the best Warhammer games around until Monday. Warhammer: Vermintide 2 is free to play this weekend and 50% off on Steam if you haven't had the chance to try it yet. Fatshark's Left4Dead-ish co-op first-person game is spot-on for a free weekend. That's enough time to try all the different basic classes, figure out the progression and loot systems and probably get through a good chunk of the levels if you throw enough time at it. Vermintide 2 has some of the best melee combat of any game, and while I don't know Warhammer lore that well, it's a really fun representation of that universe, with far grander set pieces than the also-excellent original. It's way prettier, too. Steven gave Vermintide 2 80% back in March. 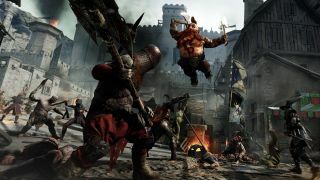 "Vermintide 2's combat and level design are so feverishly fun that I'll put up with its bad matchmaking and RPG progression if it means chopping more ratmen in half," says his verdict. Back in April, the game's difficulty was tweaked, and I've since found it a little more enjoyable to jump in and out of with the PC Gamer team. This free weekend coincides with the release of this week's Shadows Over Bogenhafen DLC, which adds two more levels to the game, as well as new quests and cosmetics.